One week from today, on Oct. 15, more than 10 million Californians will stop what they're doing and take part in an earthquake exercise. The event is called The Great California ShakeOut, and it will help save a bunch of people a lot of trouble some day. Even in California, people have trouble thinking about earthquakes. We can slide into a kind of mental paralysis -- we know it's good to prepare, but when we think about the massive devastation of a major quake, it seems like too much to handle. "Drop" means get down, not up. A big earthquake will knock you down, so get down first. Stay down. "Cover" means cover your head and neck, or get yourself underneath a table or a desk -- whatever will protect you from falling things. A big quake won't let you stand up and stagger somewhere else. "Hold on" means grab that table or desk and don't let go until the shaking stops. That's what ShakeOut participants will do on 10/15, at 10:15 in the morning. When you practice, hold on for a whole minute. That may seem like forever, but a major earthquake shakes hard for at least that long. These three actions give you the best chance of coming through a quake uninjured. Experience has shown that, in California, it's not collapsing buildings that cause most injuries; it's large household objects, flying and toppling. Stay injury-free, and everything that follows is easier. "Drop, cover and hold on" should be as automatic as putting on a seatbelt. 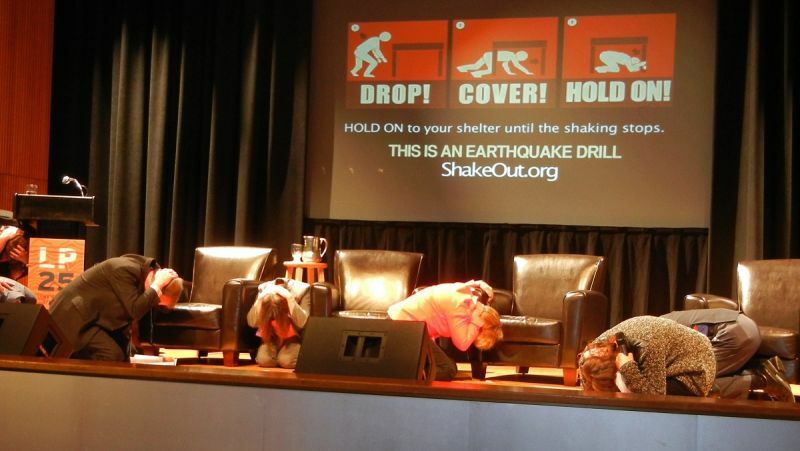 It's simple enough for schoolkids, who are big participants in the ShakeOut drill. If you have children in school, do the drill yourself wherever you are. That can start important family conversations later. Aren't there more details? Of course. The Earthquake Country Alliance has a page with instructions for special cases: if you're driving, if you're in a wheelchair, and so on. That page is Step Five of the Seven Steps to Earthquake Safety, but it may be the best starting point for exploring earthquake preparedness. If you worry about dealing with the aftermath, you can go forward to Step Six. If your thoughts turn instead to preparing in advance, you can visit the earlier steps. The "drop-cover-hold on" drill is appropriate for any location you spend time in: your workplace, the places you go for entertainment, even your church. Keep it simple. Spread the word. The Bay Area has about a dozen seismic faults that are capable of giving the whole region a damaging shake. When scientists add up the odds from each fault, they estimate the Bay Area has a two-in-three chance of suffering a major, magnitude 6.7 quake during the next 30 years. News outlets fixate on the biggest possible earthquakes. That's natural for them. But the U.S. Geological Survey's latest estimate for the whole Bay Area is that we can expect about eight magnitude 5 quakes each decade, and about one magnitude 6 quake every 30 years. Magnitude 5 and 6 earthquakes are called moderate events. The threat they pose is like the threat from a fender-bender in your car: it won't kill you but you still want to avoid it. 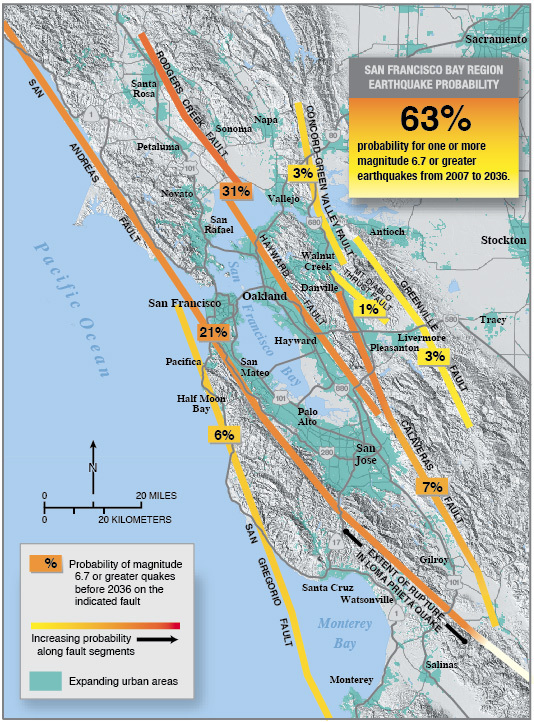 Think of the magnitude 6.0 Napa earthquake of August 24, 2014 as typical. Dealing with earthquakes doesn't require much science knowledge, but it's worth knowing a few facts. Large earthquakes come in a distinct sequence: the brief thump of P waves, the short rattle of S waves, then the long, violent shaking of surface waves. Aftershocks follow every significant earthquake. If they happen at shallow depths, they can do more damage locally than the main shock. There's no earthquake weather, no relationship to the Moon and planets, no earthquake season. Even if quakes have no season, October is earthquake month for Bay Area old-timers. It goes back to 1989, the year of the Loma Prieta earthquake, when, on October 17, at 5:04 p.m., everyone got a taste of what happens in a large seismic event. Ask any old-timer about it.